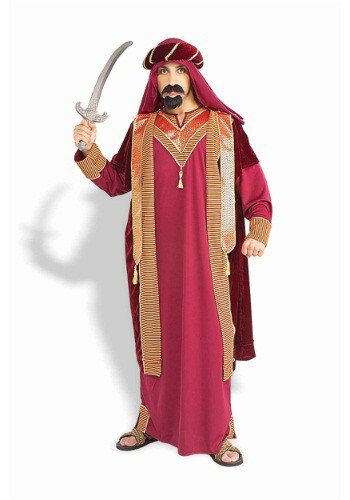 This year you can finally achieve your dreams of becoming a Sultan with this Men’s Deluxe Arabian Sultan Costume. It doesn’t come with piles and piles of gold. Or a genie. Or even a magic carpet. But hey, you’ve got to do some of the work here. Slip on this red tunic, and headpiece, then go out and find your gold with an ancient map. Find your flying carpet…those might be hard to locate now, though. And find your genie (maybe do this one first so you can just wish for all the rest). Then you can finally tell your parents that becoming a Sultan wasn't a total waste and that your MBA didn't go to total waste. Because you will be a Sultan living in a beautiful palace! And you'll have a steady job, which is really the most important thing!